In the latest in a series of successful office to residential conversions, Alex Coleman Associates have obtained Prior Approval for the conversion of Claire House and James House in Leatherhead from office (Use Class B1) to residential flats (Use Class C3). In January 2015, plans prepared by the practice were submitted by Allied Development (Holdings) Limited under Schedule 2, Part 3, Class J of the Town and Country Planning (General Permitted Development) (Amendment) (England) Order 2013 (GDPO)), seeking prior notification for re-development. The re-development consists of a change of use of Claire House and James House to use falling within Class C3 (Dwelling Houses) of the Schedule to the Use Classes Order from a use falling within Class B1 (a) (Offices) of that schedule. 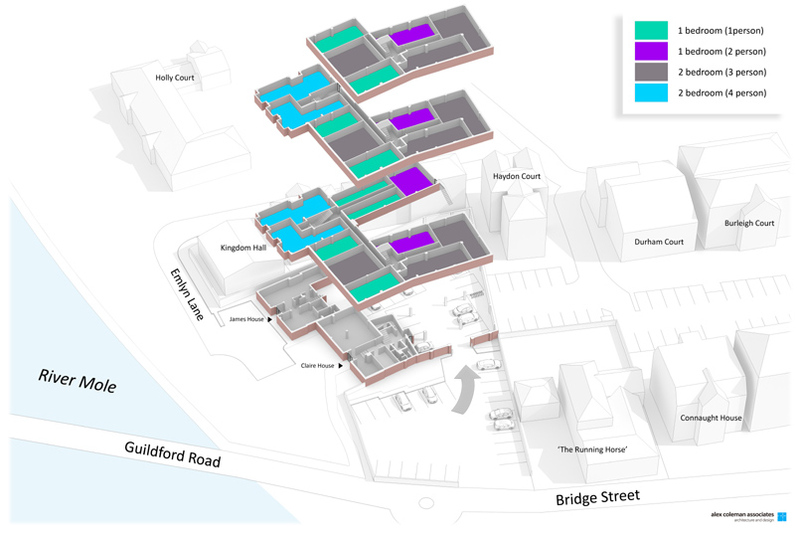 The proposal is for the Change of use of the first through third floors of both connected office buildings ‘James House and Claire House’ (Use Class B1a: Offices) to 25 residential units comprising 12 x 1 bed and 13 x 2 bed self-contained flats (Use Class C3: Dwellinghouses). The ground floors will remain in commercial use and no extensions or external alterations are being proposed. The site is currently occupied by two connected commercial buildings, comprising office accommodation arranged over ground floor and three upper floors with external car parking beneath and around the perimeter. Claire House is a four-storey office building constructed during the 1970s using a reinforced concrete frame with brick cladding. The third floor accommodation is contained within a Mansard style roof. The Gross Internal Floor Area is 1,072 sq.m (11,533 sq.ft). The property was refurbished in 2006 to a high standard finish and includes new ceilings, lighting and carpeting. All of the external windows were replaced with double glazed UPVC units. There is a passenger lift to all floors and the lift car and doors have also been refurbished. Claire House is co-joined with James House and the two properties share a private car park to the rear which is accessed through a public car park to the front of the building and to the left of The Running Horses public house. James House is situated at the junction of Emlyn Lane and Bridge Street on the north side and adjacent to the River Mole. It is a three-storey office building, constructed during the early 1980s, also with a reinforced concrete frame and brick cladding. The roof is partly flat and partly pitched. The Gross Internal Floor Area is 627 sq.m (6,446 sq.ft). To the front elevation there are three oriel style bay windows projecting from the upper floors. The site is located just outside Leatherhead Town Centre, approximately 17 miles to the south west of Central London at the junction at the end of Emlyn Lane and the western end of Bridge Street, on the north side, adjacent to the River Mole. The surrounding land uses comprise a mix of residential, commercial and retail units. It is approximately 600 metres south of Leatherhead Railway Station and it's close proximity to local amenities reduces the need for future residents to travel by car. This is further enhanced by the good pedestrian and cycle links and the location of two bus stops on Bridge Street within 70metres of the site access. It is, therefore, considered that any future residents would be easily encouraged to travel by sustainable modes, thereby reducing the impact of the development on the surrounding highway network. The site is not designated within a Conservation Area and the buildings are not statutorily / locally listed. The site is located partially in Flood Zones 1, 2 and 3 and a supporting Flood Risk Report has been prepared by RPS Group. A Transport Statement has been prepared by Vectos. The site is located within Leatherhead Town Centre and is therefore well situated for future residents to access a number of public transport links and local services and facilities. Two bus stops are located on Bridge Street within 70metres of the site and these are served by a number of bus routes providing access to key destinations including Epsom, Ashtead, Guildford and Kingston-upon-Thames. In addition, Leatherhead Railway Station is located approximately 600 metres, or an eight minute walking distance from the site via the public footpath along the River Mole or the site access to Emlyn Lane. This provides regular services to key destinations including Dorking, Horsham, Guildford, London Waterloo and London Victoria. It is proposed to retain the car park in its current location and not increase its overall size. 25 parking spaces will be allocated for resident use, equating to one per unit. This is in line with SCC parking standards for 1-2 bedroom flats in town centre and edge of centre locations. Cycle parking will be provided in line with SCC standards which state that one space should be provided per 1-2 bedroom flat. Therefore 25 secure, sheltered cycle parking spaces will be provided on-site. A communal refuse store will be provided within the building for use by residents. This will be located within close proximity to the northern site boundary with Emlyn Lane and refuse bins will be transported here on collection days, as is the current arrangement. A trip generation assessment has shown that as a result of the development proposals, there will be 34 fewer vehicle trips during the weekday AM Peak and 32 fewer vehicle trips during the PM peak hours, suggesting the proposed development will have a positive impact on the local highway network during the peak hours. It can therefore be concluded that the development proposals are acceptable in traffic and transport terms. In light of the above, the change use will have no impact in terms of transport and traffic, and the proposal compiles fully with The Town and Country Planning (General Permitted Development) (Amendment) (England) Order 2013, Class J, Paragraph N.
A Flood Risk Report has been prepared by RPS Group. The assessment considers the risk to the site from key sources of flooding, including fluvial and tidal sources, surface water, sewer surcharging, groundwater and man-made features such as canals and reservoirs. The level of flood risk has been assessed based on available data provided by the Environment Agency, the Local Authority and the Water Authority. The site is located partially in Flood Zones 1, 2 and 3. The area in Flood Zone 3 could be impacted by a fluvial flood event with a return period of less than 1 in 100 years. However, modelled flood levels provided by the Environment Agency indicate that the first floor of the site is elevated significantly above the 1 in 100 year plus climate change flood level. During such an event dry access and egress for the site is available to the rear of Claire House, either via an internal route which connects the two buildings or via a fire escape from the first floor of James House. Overall, the risk associated with fluvial flooding is considered to be low. No significant risks have been identified in relation to flooding from other (non-fluvial) sources. The development is therefore considered to be safe from a flood risk perspective. In addition, given the nature of the proposed works (comprising conversion of an existing building only) there will be no increase in flood risk as a result of the development proposal. No further assessment or mitigation is considered necessary in relation to flood risk issues. In light of the above, the change use will have no impact in terms flooding and drainage, and the proposal compiles fully with The Town and Country Planning (General Permitted Development) (Amendment) (England) Order 2013, Class J, Paragraph N.
A Site Environmental Risk Assessment has been prepared by RPS Group. Potentially contaminative land uses identified at the site include the former Works and Builders Yard both of which were present from 1963 to c. 1986. Surrounding land uses have included a Works adjacent northwest (1963 – present), a Works 10m south (1963 – c. 1986), a Tannery 40m east (1869 – c. 1896) and a Fire Station 40m west (1939 – c. 1974). The site is in a mixed commercial and residential area. Potentially sensitive receptors to contamination (if present) include the underlying Secondary A and Principal Aquifers, the watercourse 20m to the south and the residential properties adjacent to the north and northwest. The site is located within the inner zone of a groundwater Source Protection Zone. The proposed use comprises flats at first floor and above with no garden areas, limiting its sensitivity. With regards to flood risk, the site is located within an indicative fluvial floodplain. There is the potential for a degree of contamination to be present beneath the site. However, the Environmental Health Officer at MVDC does not consider it likely that residential properties on or adjacent to the site would be impacted by significant contamination. Additionally, following the proposed change of use, the site is proposed to remain entirely covered by hardstanding / building footprint and no ground break is proposed as part of the change of use. Furthermore, the proposed residential units will be at first floor level and above, which would prevent ingress of any volatile contaminants into the properties. Overall, it is considered that the site is suitable for its proposed use from a ground contamination perspective. No further work is considered necessary considered necessary in relation to ground contamination for the proposed use. It is, therefore, clear that in terms of contamination the risks are low and this scheme complies fully with The Town and Country Planning (General Permitted Development) (Amendment) (England) Order 2013, Class J, Paragraph N.
The above is reflected in the Community Infrastructure Levy regulations. Clearly under Class J, Local Planning Authorities can consider transport and highway impacts resulting from development, and in doing so, should consider the National Planning Policy Framework and development plan policies. Both of which say planning obligations can be used to address impacts. Overall, there would not be a noticeable impact on public transport services as a result of the proposed change of use, particularly when considered in the context of the existing permitted use of the site as B1 office floor space. It is expected that the proposed change of use will result in a reduction in travel demand to / from the site. For the reasons set out above, the proposed change of use to residential will have no adverse impact in terms of highways and transport, ground contamination or flooding. It is, therefore, clear that the proposal complies fully with The Town and Country Planning (General Permitted Development) (Amendment) (England) Order 2013, Class J and constitutes permitted development.